FIGURE 1 Organization of motor and sensory cortex. (A) Lateral and (B) medial views depicting Brodmann's numbering system for cortical areas. Motor I (MI, or area 4) is shown in dark blue. Area 6 contains the premotor area (PMA) laterally and the secondary motor area (SMA) medially. The primary sensory cortex (SI) is shown in gray. Two association areas involved in motor planning are the prefrontal cortex (light blue) and the posterior parietal cortex (SII) (light gray). 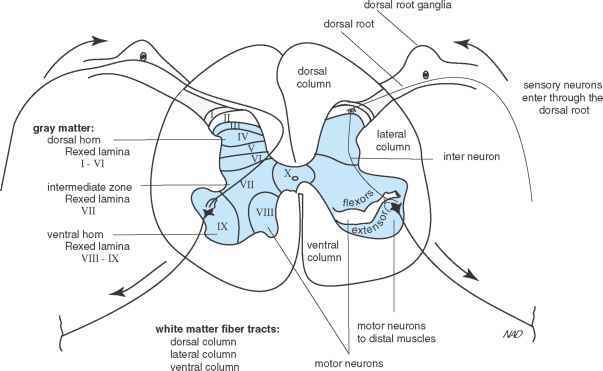 (C) Origin of the corticofugal paths from the primary motor cortex; the corticobulbar tract supplies the head, the ventral corticospinal tract (CST) supplies the axial and proximal muscles of the body, and the lateral CST supplies the distal muscles of the extremities. (D) Location of MI areas controlling various areas of the body. The homunculus is drawn to show the relative size of cortical representation. Note the huge area devoted to control of the face and hand compared to the area that controls of the rest of the body. jaw f°ngue throat subcortical regions—namely, the basal ganglia and the cerebellum (as discussed in Chapters 58 and 59). Recognition of the motor strip as being the primary motor area is based on its obligatory role in initiating movement and its low threshold for eliciting a motor response. Several other areas of brain, when experimentally stimulated, can lead to movement, but the motor strip does so at very low thresholds. The output neurons of the motor strip are pyramidal cells, the major class of upper motor neurons in the brain. These large cells are located in cortical layer V, and their size and number help distinguish this area from surrounding ones. This type of histologic characterization has been used in establishing the Brodmann classification scheme, which defines 50 different areas of brain. The motor strip is designated as Brodmann's area 4, and the motor association area just anterior to it is designated as Brodmann's area 6. In a more recent classification scheme based on functional differences, area 4 is designated as MI, area 6 as MII, the primary somatosensory area as SI, and the sensory association area just posterior to it as SII. As pyramidal cell axons exit the motor cortex, they project as corticofugal fibers to lower motor neurons throughout the brain stem and spinal cord. Three major divisions are recognized: (1) the corticobulbar tract, which supplies cranial nerve motor nuclei of the head and neck region; (2) the ventral corticospinal tract, which innervates lower motor neurons of the axial and proximal muscles of the body; and (3) the lateral corticospinal tract, which projects to lower motor neurons of the distal muscles of the extremities. Approximately half of the corticofugal fibers arise from MI. The remainder originate from MII, SI, and SII. The current theory about pyramidal cell function is that these cells represent primary threshold elements or gatekeepers that make the final decision about when to trigger the motor command. The urge to initiate a purposeful movement does not originate de novo from within pyramidal cells in MI; rather, these cells occupy a central position within various input loops, supplying sensory information about current internal and external environmental conditions, as well as information from past experience in the form of sensory and motor memory. Direct inputs carrying various forms of sensory information to MI and MII motor neurons come from nuclei in the thalamus (VL, VA, and CM) and from other cortical areas, including motor association areas in the frontal lobe and areas SI and SII. These are the staging areas for gathering sensory information from widespread regions. Goal-directed movements depend on knowledge of where the body is in space, where it intends to go, and how it intends to get there. Once a plan for movement has been selected, it must be held in memory until the time when instructions are issued to implement the plan. Although MI plays the major role in issuing motor commands, other areas are responsible for the planning stages.